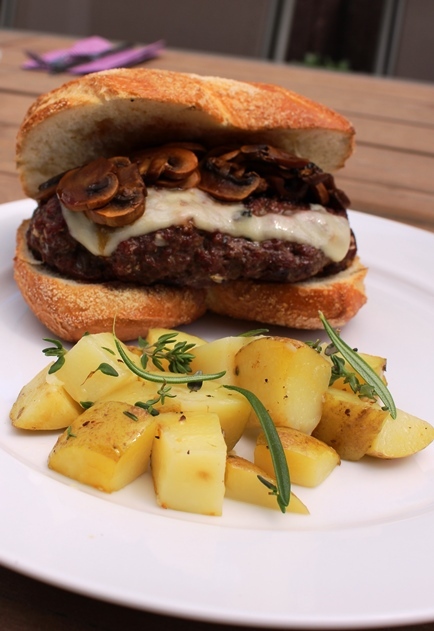 Tuesday of this week was National Burger Day in the US…so Alex and I celebrated on the most beautiful day of our staycation by grilling Mushroom Swiss Burgers for lunch. We escaped into the forest for a few hours between appointments as well for a hike. I will have to bring my camera with next time, though the peacefulness and beauty will not be done justice with a camera! Forest in walking distance is one of the many benefits that our home here has! Anyway…we were talking about burgers. And grilling. Grilling is one of the ways I have gotten Alex excited about what we eat. We have a pretty standard Weber kettle grill that made it’s way to Germany in my shipping container when I moved here. Weber grills are CRAZY expensive over here! It was a good investment though as we use it a minimum of twice a week in the summer and probably about once every two or three weeks throughout the winter. Alex will have to share some of his grilling techniques with you all one of these days though as I just prep it, he then grills it. Team Link, here we go! First, dice up the shallot or onion into very small pieces. Add the beef and shallot to a large bowl. Crush the garlic with a garlic press into the bowl, and then add the Worcestershire, salt and pepper. 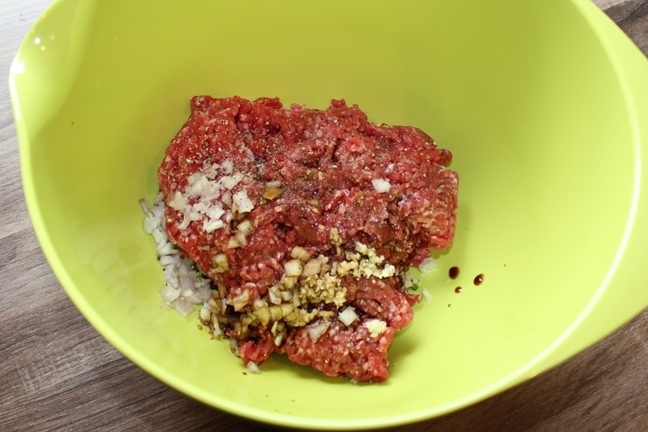 Mix the ingredients well with your hands, then form the mix into patties. We made two this day, but for a pound of beef I would make three of them instead. As our buns were a bit of a different shape, I shaped them a bit odd here! 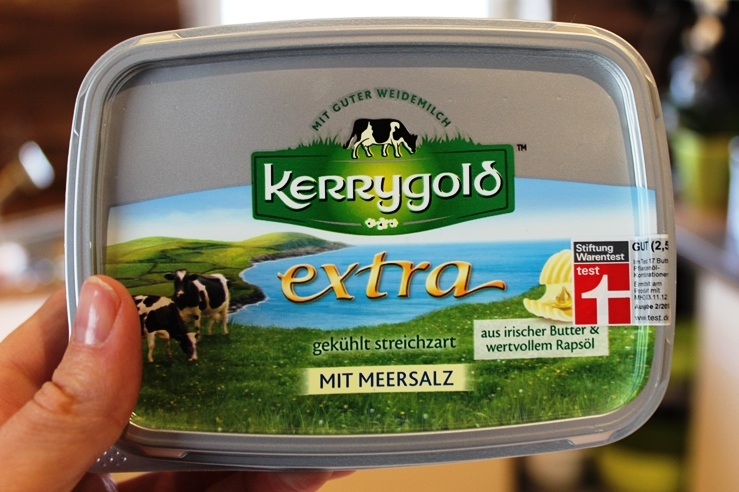 How could I of all people forget the BUTTER?! Slice up the mushrooms, and prepare them to grill. 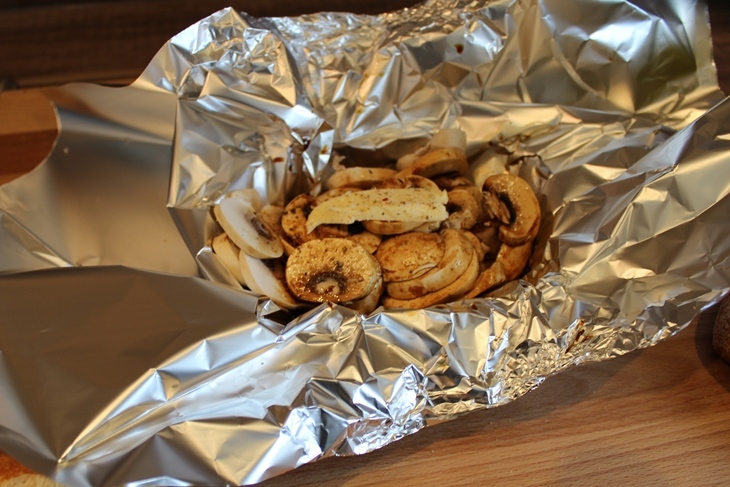 They will grill in a foil packet. As there is liquid involved, I lined a small bowl with foil, added all the ingredients and then added it all before folding it up. We toasted our buns that day too…highly recommended! Just spray them with a bit of olive oil spray first! When it’s all done, assemble your burger…and if you’re me, try to have enough patience to take a picture before taking a bite! 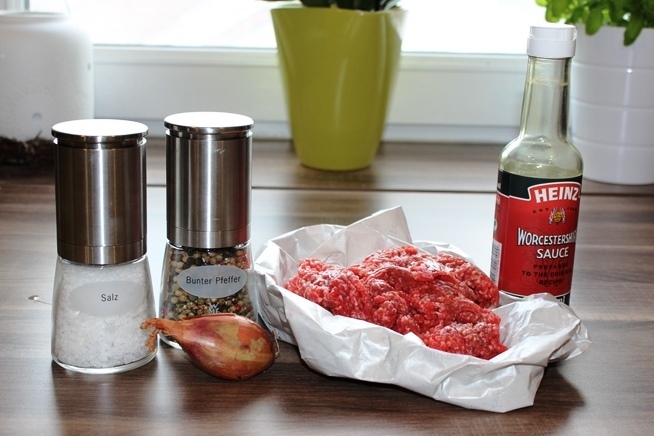 Mix all burger ingredients in a bowl, then form into three patties. Cut a large piece of foil and line a shallow bowl with it. 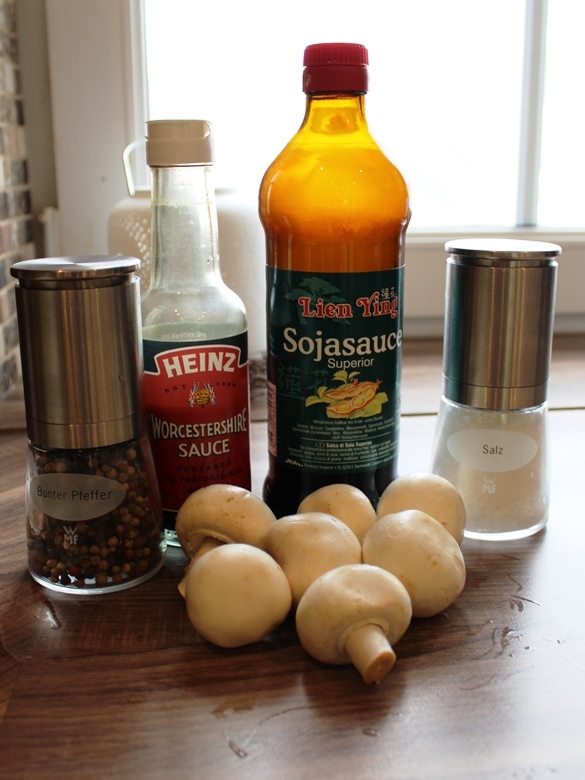 Add all mushroom ingredients, and then seal the package, keeping the ends all high to ensure the liquid doesn’t seep out of the package. 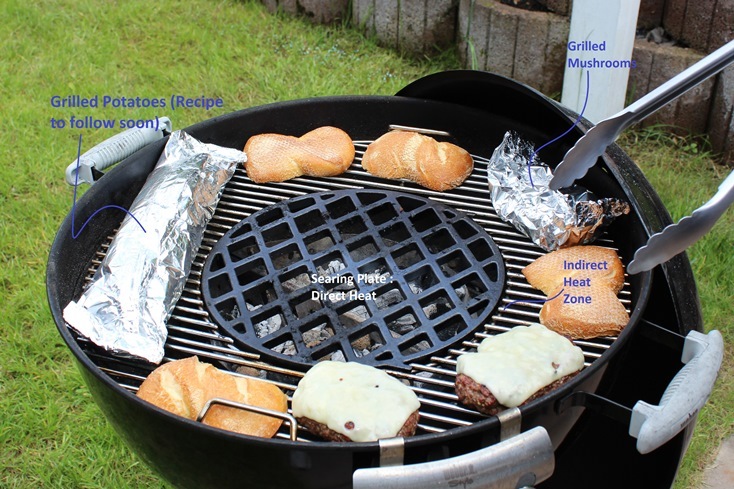 To grill, the mushrooms will require 15 minutes of indirect heat on the grill. For the burgers, first sear them over direct heat and then move to the indirect heat of the grill until they reach your desired level of doneness. 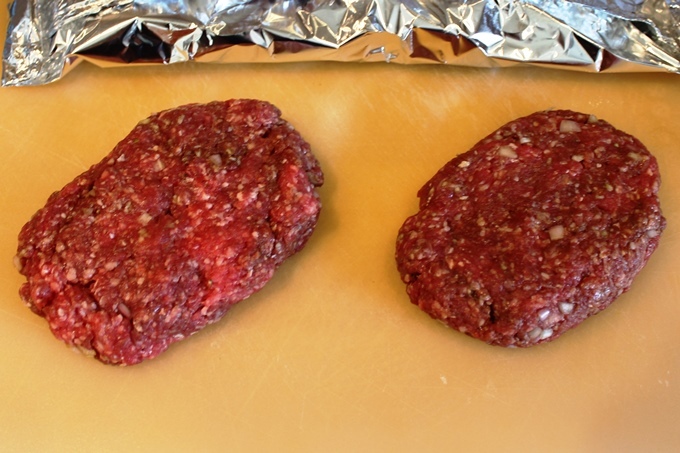 Just prior to removing from the grill, cover with a slice of Swiss cheese. Assemble the burger and most importantly, enjoy!